When I was growing up, my mother and all her siblings had these really cool handmade sculptures in their home. I discovered that my grandfather, whom I never had the chance to meet, was the artist behind them and many of the paintings hung throughout the respective homes. I have never attempted any sculpture at all before so this piece was a big challenge for me. I went in with some structural concepts in mind, some wire and some clay. After a few weeks, I completed my first three dimensional piece of art. 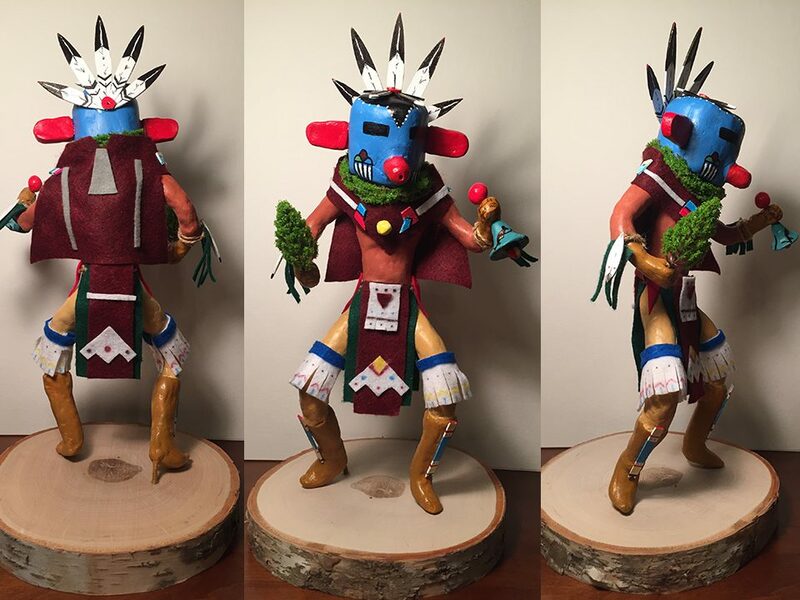 “The Morning Singer” Kachina Doll sculpture. I made this as a Christmas gift for my mom and it will go right next to the one she has on display from her father. Hopi Tribes were located in the southwestern United States and lived in pueblo dwellings carved out of the hills and mountains of the region. “The Morning Singer”, (Talavai Kachinas) used to appear in pairs on the rooftops and sing songs, waking the Hopi people in the village. Occasionally, they sing as they stand holding their spruce trees and ringing their bells. During the day, they would dance with the other Kachinas, whom they led and prompted in the singing. They still appear with the other Kachinas in the Powamu Ceremony and are most often standing in a set to one side of the main movement of the procession.The Powamu Ceremony is also called the Bean Planting Festival. It is observed in late January or early February and lasts 8 days. This is the time of year that I am presenting the finished artwork to my mom. This is a very special gift and it means a lot of me and my entire family. I am honored I found the ability to complete it.